From Apple to GE to Toyota, this valuable report identifies those companies that have developed Web sites that combine global reach with local usability. In all, this report rates the Web sites of 300 companies across 22 industry categories. More important, this report illustrates the best practices that these top Web sites share so that you can ensure that your companys Web site will avoid the expensive and time-consuming mistakes made by those that went before. You’ll learn exactly which companies are improving at web globalization — and why. Through detailed website profiles, loaded with screen shots, you'll learn which practices to emulate and which to ignore. An entire section is devoted to the top 20 best practices and top 10 emerging trends in web globalization. 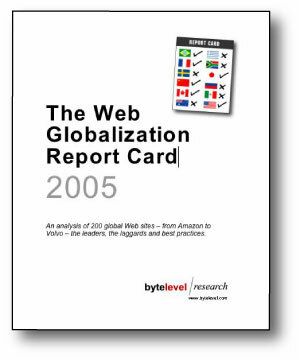 Contact us if you would like to purchase this report or the entire Web Globalization Report Card library. Companies that have purchased the Report Card over the years include: 3M, Abbott Labs, AOL, Cargill, Cummins, Deloitte, Euro RSCG, Monster, LexisNexis, Lionbridge, Philips, Seagate, Sun, Symantec, Toshiba, The World Bank, Yahoo!, and many more. What Makes a Good Global Web Site Great?